Fujifilm | Color Ink, Inc. The Uvistar Pro8 from Fujifilm – a versatile printing monster. Extra, extra! Read all about it! 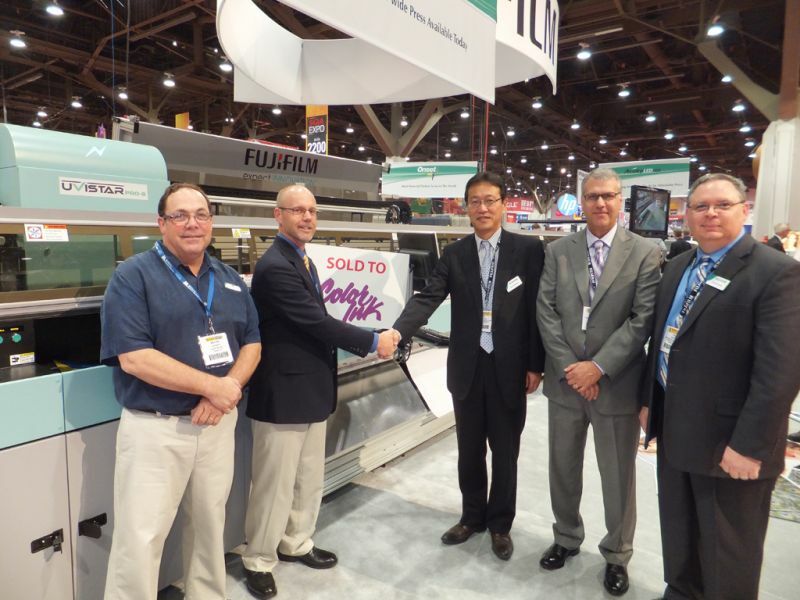 Color Ink has purchased an impressive press for their large format department – the flexible Uvistar Pro8 from Fujifilm. First introduced at the 2012 Specialty Printing & Imaging Technology SGIA Expo, the Uvistar Pro8 is one of the most versatile printers on the market. UV curing inkjet technology is rapidly progressing and is now the slam dunk favorite to print superwide graphics. UV inkjet offers instantaneous curing and is both clean and efficient. The Uvistar Pro8 specializes in poster and PoP materials, billboards, vehicle graphics, and backlight signage over 16 feet (5 meters) wide. The automatic rigid media system widens the range to also include exhibition graphics, PoP displays, graphic arts, and other indoor displays. Plus, printing on polyethylene for single skin posters is now available. It’s easier than ever to differentiate yourself from the competition! The following are the three most significant features of the printing monster known as the Uvistar Pro8. Multi-file printing allows three different images to print simultaneously. The scale up function of the press makes it possible to magnify print files two to four times their original size while greatly reducing the RIP time of said files. 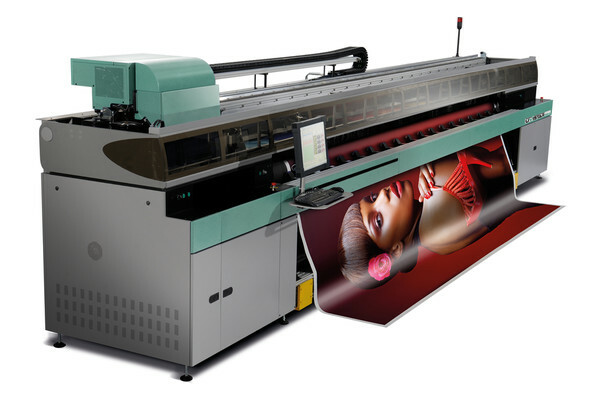 In-line finishing utilizes cutters which trim and separate images on the go, saving valuable time. Plus, the Uvistar Pro8 features throughput speeds faster than 1,148 feet (350 meters) squared per hour, vastly cutting-down on production time. Uvijet inks are the ‘life-blood’ of Uvistar. Made using their patented Micro-V dispersion process, Fujifilm is able to reduce pigment to sizes smaller than a human cell. Higher pigment concentrations mean stronger, more vibrant colors which pop off the page. Uvistar ink also adheres extremely well to most PoP materials while offering class leading quality and excellent spot color reproduction. It’s also great on heat sensitive substrates such as polyethylene. Advancements in software technology have made it possible for Fujifilm to create an algorithm, Parallel Drop Size (or PDS), which allows jetting within the same print pass of small (20 pl) and large (40 pl) droplets without reducing speeds. This unique usage of smaller droplets smooths out images which have the tendency to appear grainy when viewed up close. So if you’ve got large format printing needs, there is no doubt that the Uvistar Pro8 can fulfill them in the quickest, most efficient, high-quality manner possible. Links to other press regarding Color Ink’s monumental purchase can be found here, here, & here.